The portal opened a crack this week and I stepped through it once more. We pulled it off, in this time of reflection, Passover and the Easter season. Liberation. Resurrection. New Life. And a reunion of sorts, 74 years in the making, to commemorate it all. 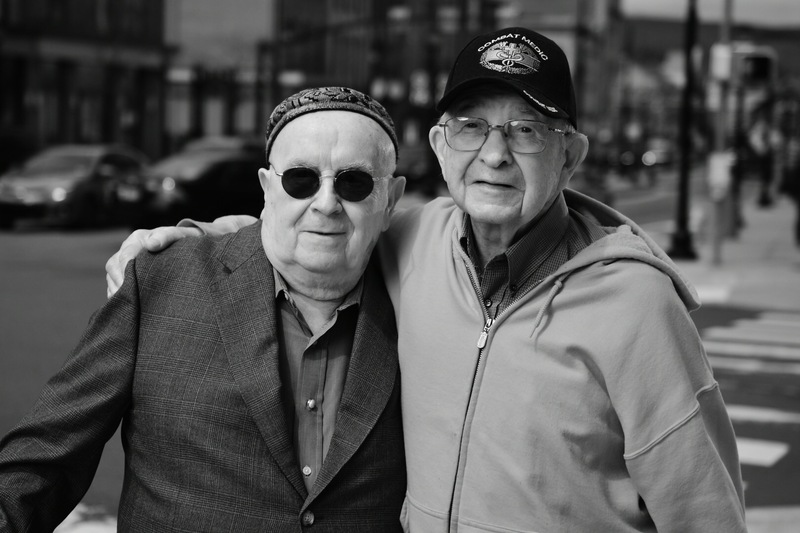 Holocaust survivor Judah Samet and WWII medic Walter Gantz, 4-17-19. There were a lot of moving parts, but we got a chance to orchestrate another survivor-soldier reunion—this time with WWII Army medic Walter Gantz and Holocaust survivor Judah Samet, in Walter’s hometown of Scranton, PA. We had a very short window of time, as we needed also to film the encounter for our upcoming PBS documentary, and my friend Mike Edwards and his crew of film and sound techs had to be available. Since Judah is 5 hours+ away in Pittsburgh—remember, he is also a survivor of the horrible shooting mass murder at his synagogue there last October—and he was coming east to visit for the Passover holiday. His daughter had to be available to drive him a couple more hours north, and then be back home later for family obligations. Walter was preparing for Holy Week and Easter. Mike was to be soon traveling to Africa on another filming expedition, so we picked Wed, April 17th, for the meeting at a hotel in Scranton. I drove down from the North Country of upstate New York the evening before. Settling into the hotel, management called my room to tell me that Walter was in the lobby, so I hurried down. Mike had arrived with his crew, Joe and Danny; Mike the sound guy was coming in from Brooklyn later. Now, though I have been conversing with Walter for eight years on the telephone, I had not met him ever before. He’d met other survivors, notably Micha Tomkiewicz and Elisabeth Seaman, and had been called by others like Ariela Rojek in Toronto. But it was the first time he would be meeting me, and he arrived an hour before the dinner we had scheduled with his family and loved ones. We talked for a while. He lives only three minutes away in the hills overlooking the city, the ‘Polish Alps’ as he calls it, where his parents had raised him, most of the community having emigrated from Poland in the early part of the previous century to work in the mines. He remembered attempts at conversations with the Polish survivors at Hillersleben, how he could pick up word and phrases, and he remembered Micha’s Polish mother distinctly, an educated woman who also had medical knowledge and training. He remembers Gina Rappaport, a survivor from the Krakow Ghetto who spoke seven languages and translated for the people on the train. And he was so sorry to have missed the reunions (11 in all) in the past, but I did not even know about him until he called my classroom in October 2011, shortly after our Sept. 2011 final school reunion… It was liberator Frank Towers who had given him my number, it turns out, and it was Frank who had also contacted Judah Samet in the years before Frank’s passing at 99 in 2016; I suppose then that Frank had a hand in organizing this mini-reunion. Walter’s three daughters and sons-in-laws arrived for the dinner, taking pictures, getting me to sign copies of my book. The next morning at breakfast, Mike explained how he hoped the day’s filming would go, but we were both of the mind to have everything unfold as naturally as possible. Walter would be waiting in a private room, and I would walk Judah down after he arrived with his daughter. 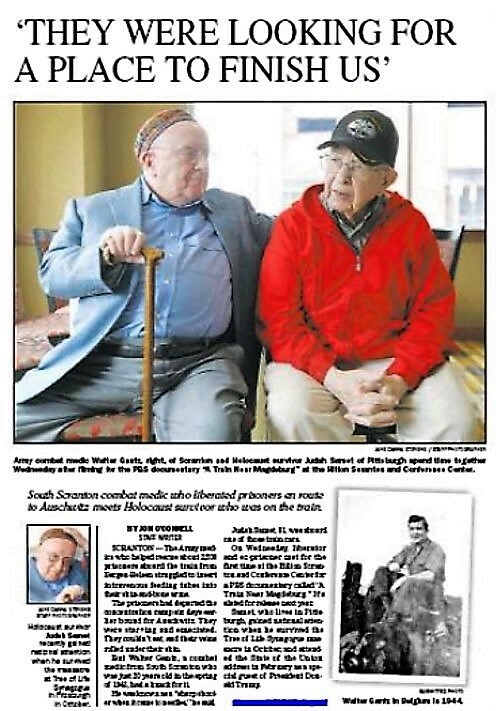 Holocaust survivor Judah Samet and WWII medic Walter Gantz, 4-17-19. CR: 5 Stones Group. They sat down and began to speak like they had know each other all of their lives. I sat with them and nodded quietly as the cameras rolled and asked clarifying questions when I could help out. But they had it together, as I knew they would, Walter gripping Judah’s hand. We took it outside on the street for a mini-photoshoot, and Judah’s daughter got acquainted with Walter’s daughters, coming outside to join in. The local newspaper guys arrived, and got a good story for the hometown hero (Walter just called me tonight to say that he had even fielded a congratulatory phone call from California!). What does it all mean? Well, I think of this season of freedom and new life, about how, 74 years almost exactly to the date of release from oppression (but certainly not hard times—Judah’s father and many others died after liberation as well) these two men, the 94-year-old and the 81-year-old (the former 20-year-old and 7-year-old) and their families had the chance to re-connect and embrace, to recall and to marvel at the wonders of the power of love eclipsing the barriers of time and space. Thank you to all of the film donors who helped to bring this about; we look forward to sharing this footage with the world when the next anniversary of the liberation rolls around (though we still have to get to Germany, etc). The wires are tripping, and the cosmos are opening once again. 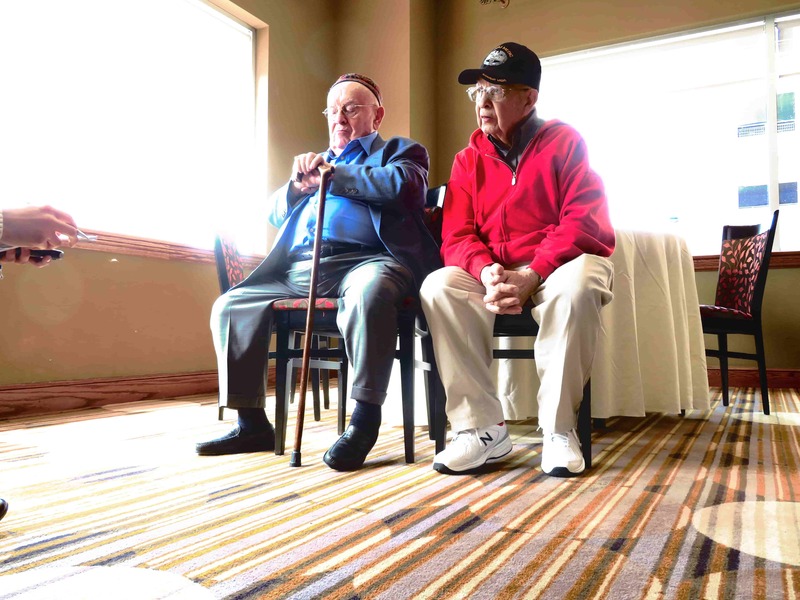 SCRANTON — The Army medics who helped rescue about 2,500 prisoners aboard the train from Bergen-Belsen struggled to insert intravenous feeding tubes into their skin-and-bone arms. The prisoners had departed the concentration camp six days earlier bound for [Theresienstadt in German-occupied Czechoslovakia]. They were starving and emaciated. They couldn’t eat, and their veins rolled under their skin. But Walter Gantz, a combat medic from South Scranton who was just 20 years old in the spring of 1945, had a knack for it. He was known as a “sharp shooter when it came to needles,” he said. 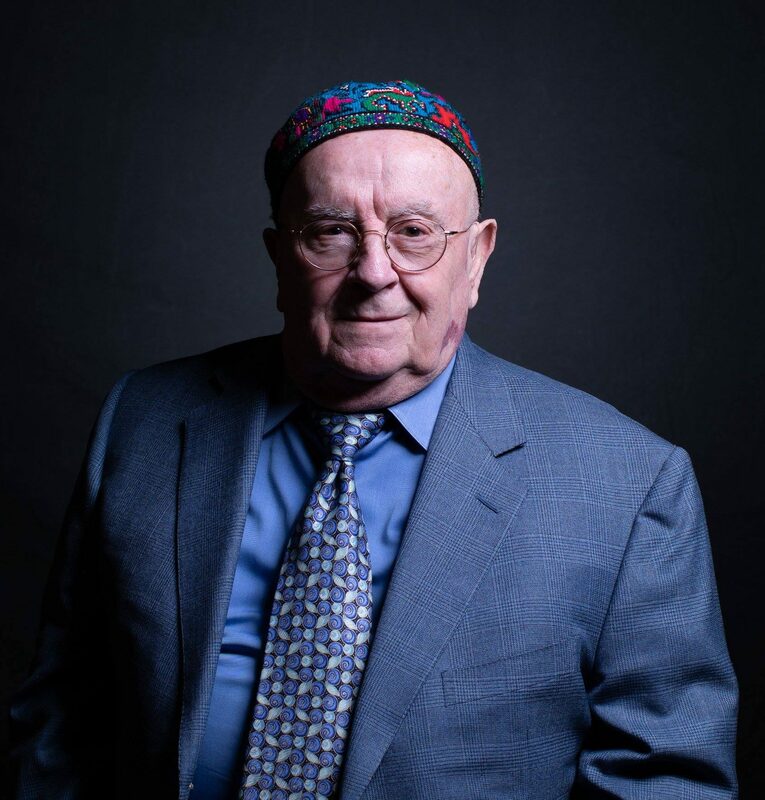 Judah Samet, 81, was aboard one of those train cars. On Wednesday, liberator and ex-prisoner met for the first time at the Hilton Scranton and Conference Center for a PBS documentary called “A Train Near Magdeburg.” It’s slated for release next year. 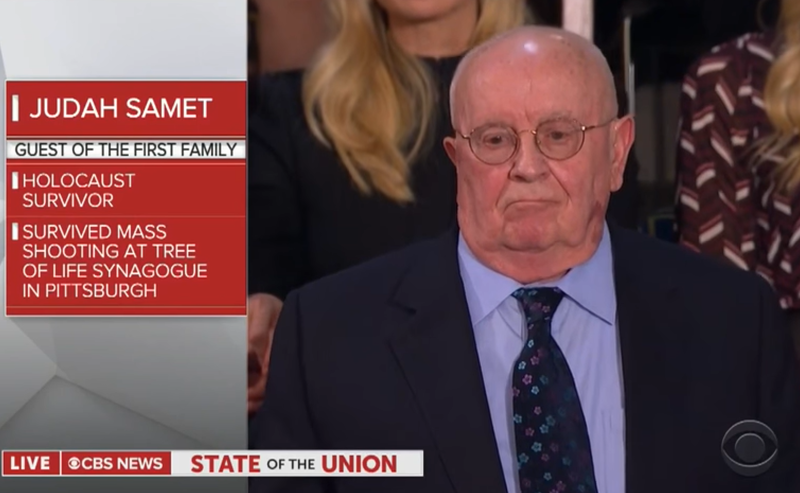 Samet, who lives in Pittsburgh, gained national attention when he survived the Tree of Life Synagogue massacre in October, and attended the State of the Union address in February as a special guest of President Donald Trump. Back in 1945, Samet was only 7, but he remembers using a man’s corpse as a pillow and to block the April chill leaking through the slats of the car. He remembers feeling angry when Nazi soldiers eventually threw the body off the train. He recognized their murderous intent. “They were looking for a place to finish us,” Samet said. 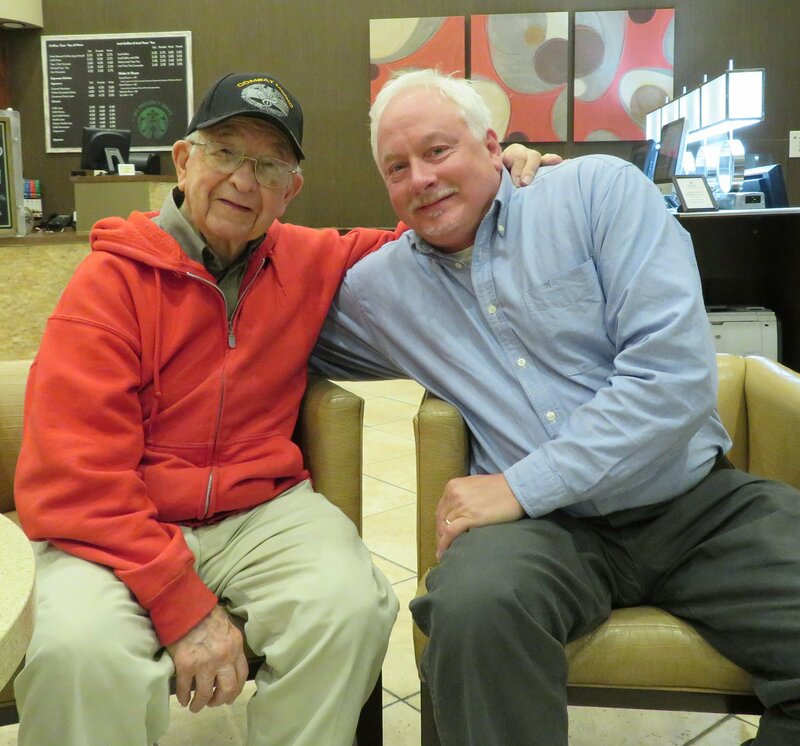 Historian Matthew Rozell, a retired world history teacher who began interviewing World War II veterans with his students in Hudson Falls, New York, has become an expert on the April 13, 1945, liberation. His research, and a book he wrote about the liberation, laid a foundation for the documentary. He brought Samet and Gantz together for one of the last joint interviews between prisoners and soldiers for the documentary. Since first learning about the rescue in 2001, Rozell, [liberating soldier Frank Towers, now deceased, and survivor’s daughter Varda Weisskopf] have found nearly 300 survivors. They’ve held 11 reunions on three continents, he said. “Walter never went to any of the reunions [held at my high school] because I didn’t know Walter existed,” Rozell said, explaining how Gantz eventually learned about his work and tracked him down. The 743rd Tank Battalion, which had been attached to the 30th Infantry Division, discovered the train in Farsleben, near Hillersleben where the 30th infantry had taken over a Luftwaffe air force base and research facility where top Nazi scientists developed secret weapons, Rozell said. The medic, who gave up his “sharp shooter” nickname and now introduces himself as “the coach,” spent seven weeks in Hillersleben tending the rescued prisoners, nursing back to health those who could be saved. Still, more than 100 died after the rescue, Gantz said. Seated next to Gantz inside the hotel on Wednesday, Samet remembers the strength he drew from his mother, Rachel, a brilliant caregiver whom he says outsmarted the Nazis and kept them alive by rationing bits of hard black bread the size of olives throughout their 10½ month ordeal.